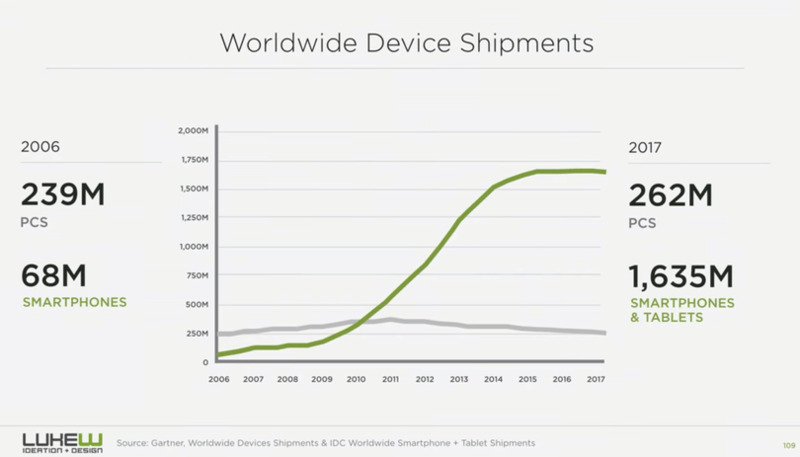 Since the launch of the iPhone in 2007, mobile filled a huge gap in the computer devices industry. Numbers speak by themselves. As a reminder before we dive into figures, we're 7.6 billion around the globe as of 2018. Among these people, the potential market for mobile apps is of 5 billion (i.e. people with a mobile phone). To put things into perspective, note that there are currently 1.3 billion of active desktops and laptops (1.2B Microsoft from which 700M Windows 10, and 110M Mac). 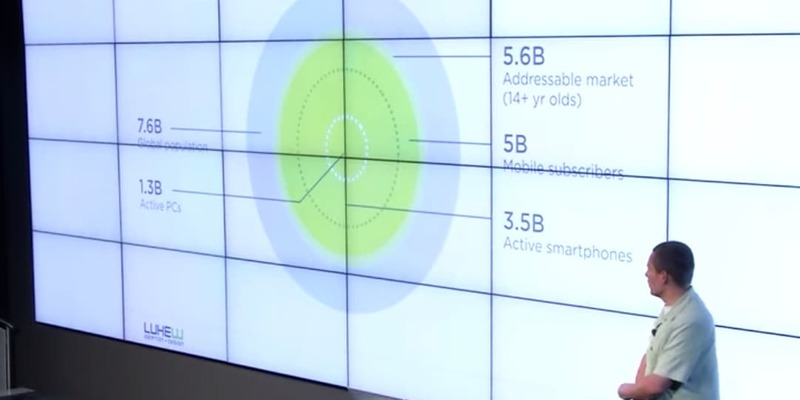 In 2023, we're planned to hit 5B active smartphones, and population should be around 8B. 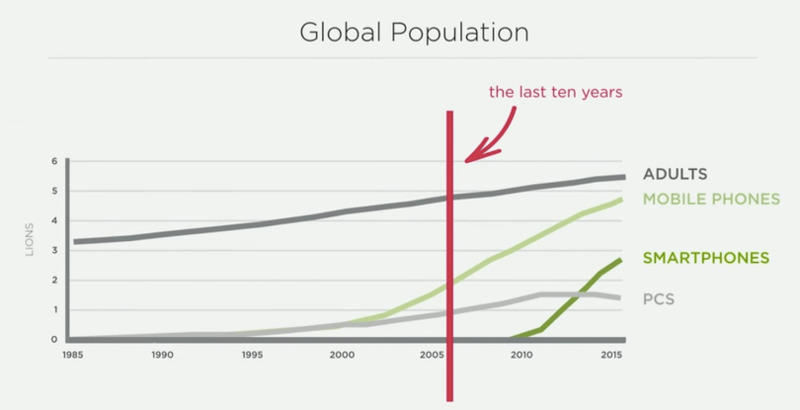 In 10 years, we went from 68M to 1.7B smartphones sold per year. As of 2017, the cumulative numbers of devices currently on Earth were: 3 billion of smartphones, and 1.5 billion of PCs. Regarding shipments, Apple takes a 15% share and Google Android the remaining 85%. This is explained by the different pricing strategy with Google covering a wide range, while Apple focuses on the high-end mostly. If we think in terms of active smartphones, the split between the two operating systems is 25% of Apple iOS and 75% of Android. On average, statistics say that an Apple user keep his device for 4.25y, and an Android user for 2y. Let's take the example of Facebook over the last decade. On desktop, they went from 12M Monthly Active Users (MAU) to 120M MAU. 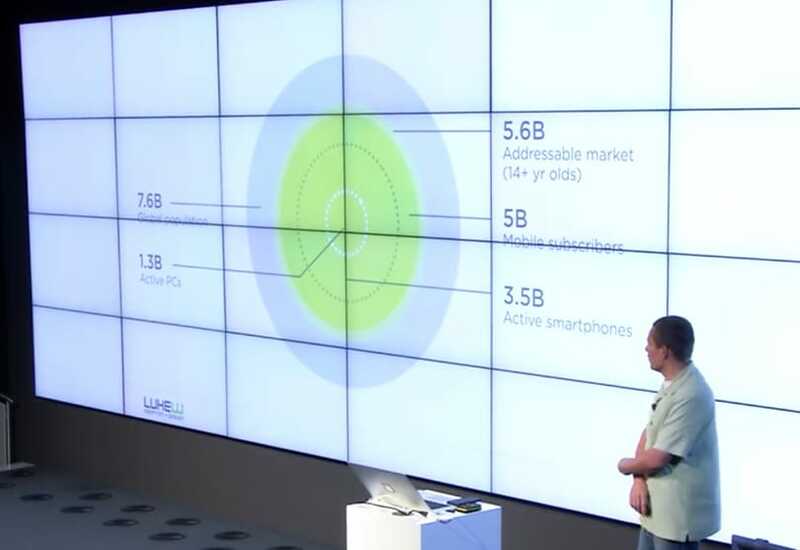 On mobile, they started from 12M MAU to end up at 1.74B! As of 2018, the time spent on mobile app per adult in the US was 3 hours. It's the only media that goes up compared to other medias such as TV or laptops. 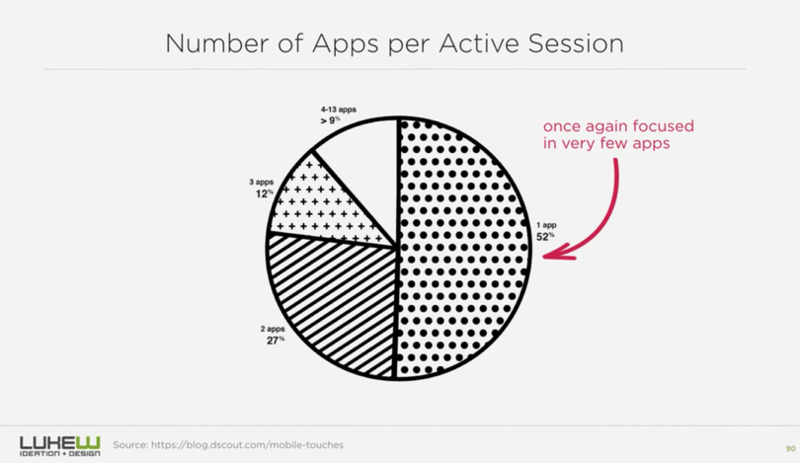 From these 3h, 169 minutes are spent in apps vs. 11 minutes in mobile web. Between 2005 and 2016, the app growth pace increased. Dramatically. Mobile payments are not only a trend. To back this up, you just need to look at Paypal. It had <1M USD of mobile payments in 2006. It reached 102B USD in 2016. The Google Play Store announces to have 2.8B apps, while the Apple App Store claims 2.2B apps. This means that every month, 2 apps are downloaded per person on the planet! But don't get excited too fast with your company mobile app project... because of the apps downloaded, only 1/3 to 1/2 are used every month. Another warning you should be careful if you develop or own a mobile product: don't focus on the vanity metrics of downloads, and better check the usage one. If you follow the tech industry, you must have seen all the initiative of the GAFA and co to tackle issues of India and China countries. Wonder why? Because their future growth will come from there. Both countries have 1.3 billion inhabitants. In India, there is only 22% of market penetration by mobile. And 52% in China. 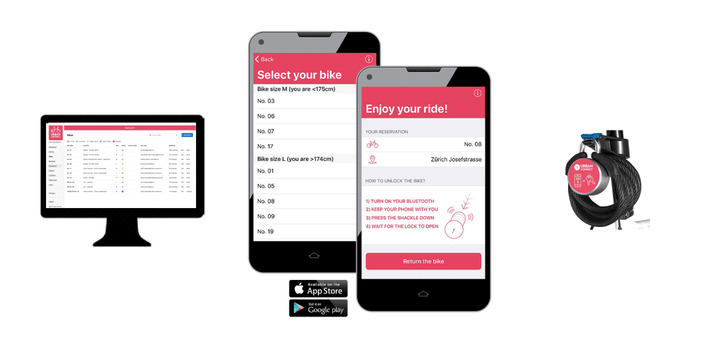 With all these numbers, you could think "Let's go, let's build a native mobile app!" But be sure to know your market. Statistics and behaviours of a region on the planet do not reflect the entire's planet behaviour! For instance: even though there is a 70% market penetration of mobile in the US, the usage pattern during Cyber-Monday represents "only" 33% of purchases on mobile. 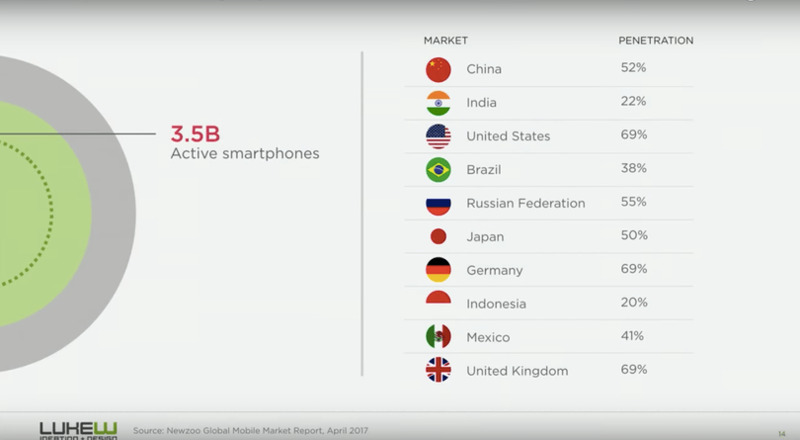 Versus China who has "only" 55% of mobile market penetration, with an usage pattern that is 90% of mobile purchases on their biggest "Single's Day". So you better analyze your market before crafting anything. 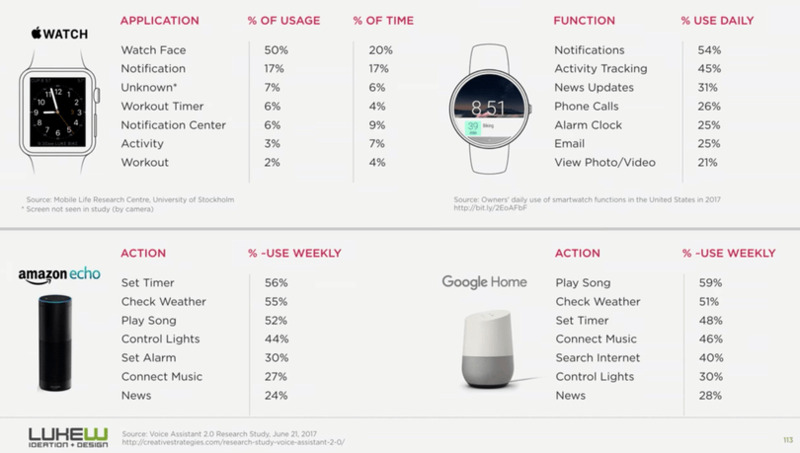 So, why does mobile matters? Mobile has this power of distribution that never existed before. One app, one click, and you can reach half of the planet in less than a minute. This creates many opportunities. Nevertheless, it's hard to maintain a good retention rate as usage decreases a lot during the first days after the app gets downloaded. 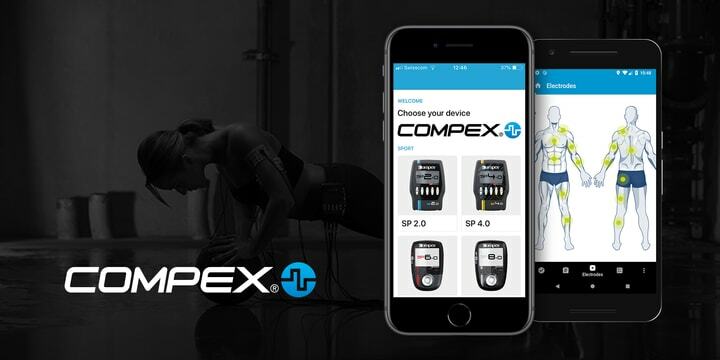 That's why at Liip we focus our business development efforts on apps that have a use in the everyday life, such as Urban Connect, Houston, Compex Coach, and One Thing Less. 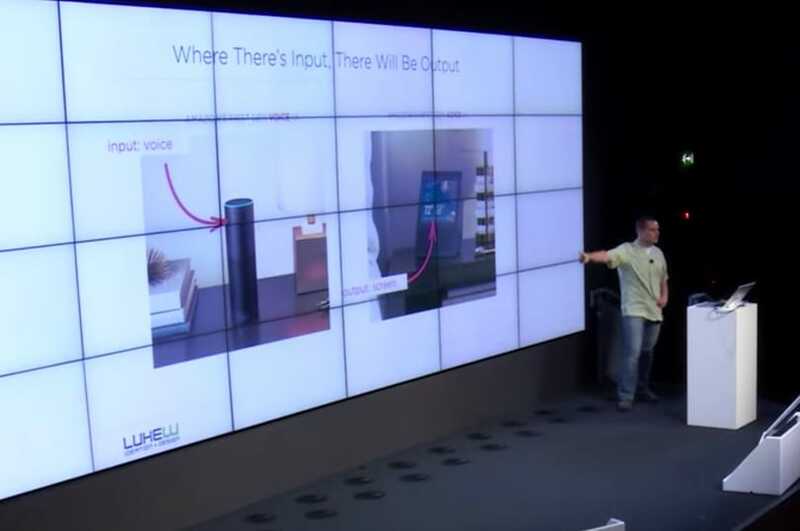 What's the future of mobile? 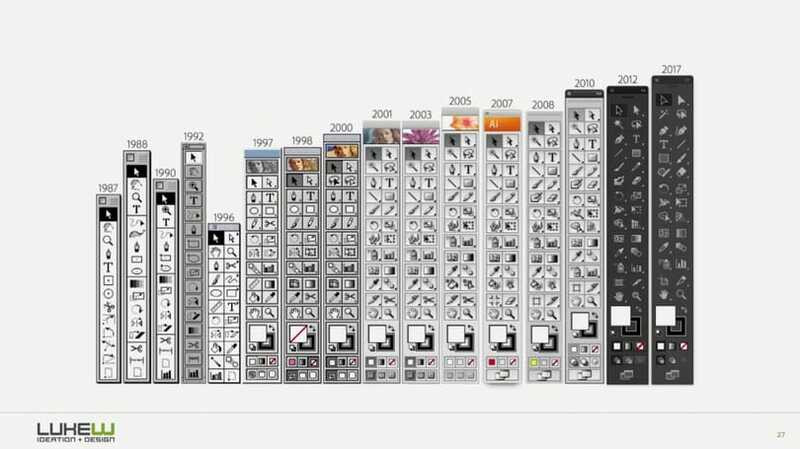 Iteration is cool, until you need more innovation. And to innovate you got to get back to your vision, aka your North Star. What are you trying to achieve? Even more important, why are you trying to achieve it? 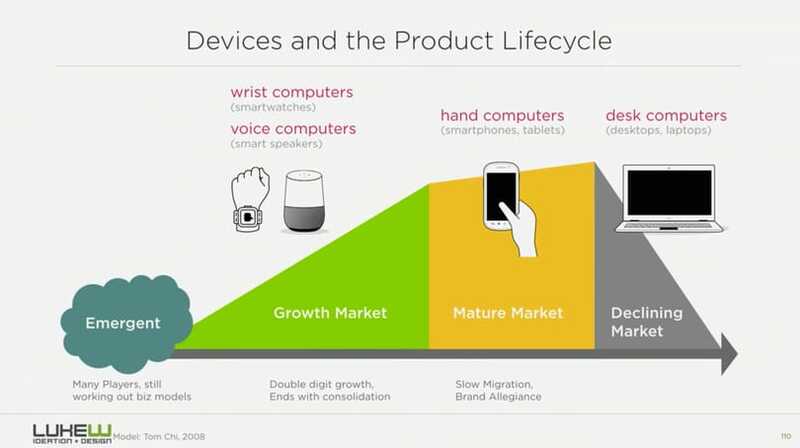 Luke sees the future of the mobile realm in 3 trends: device hardware capabilities, wrist computers, and voice devices. 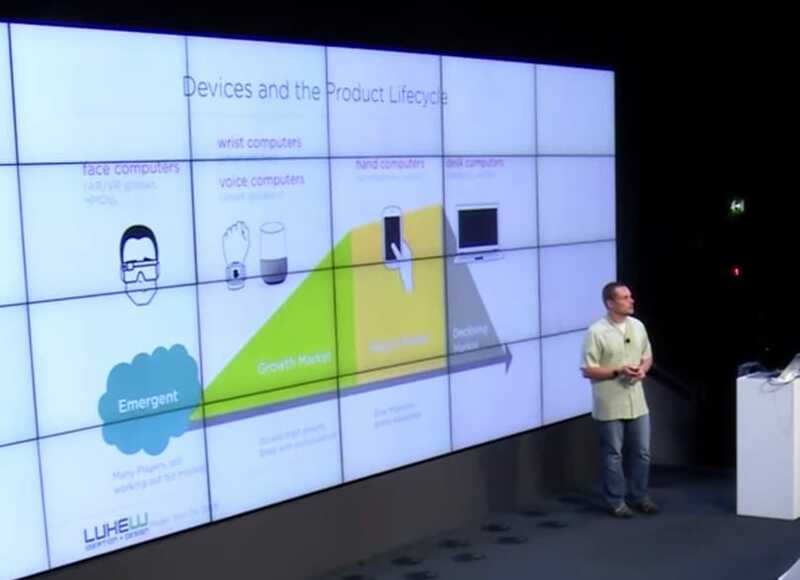 One possible future for mobile devices resides in the devices' hardwares. Things such as camera, sensors, etc. Amazon Dash with its "One button to order"
Even more actual are the wrist computers like the Apple Watch, and voice devices like Alexa from Amazon. These innovations are in the growth phase and we start to grasp their value, as we did with mobile phones back in 2010. 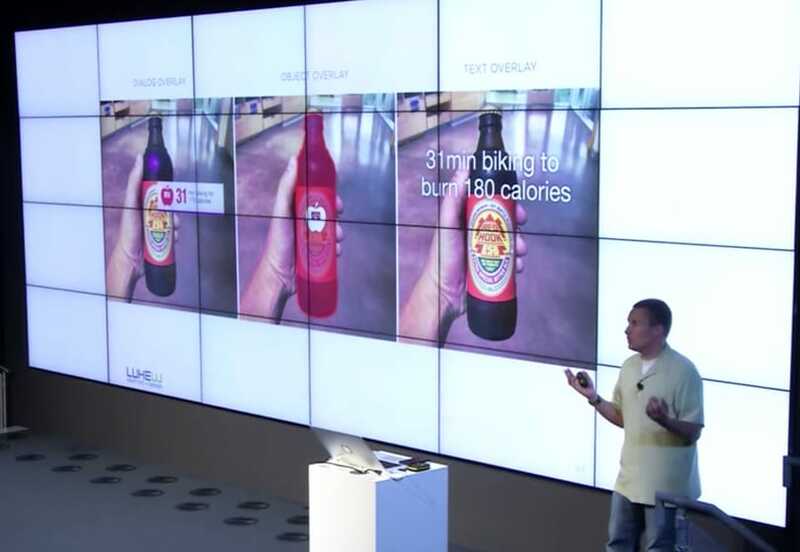 There are existing products out there and mass market use cases start to emerge. 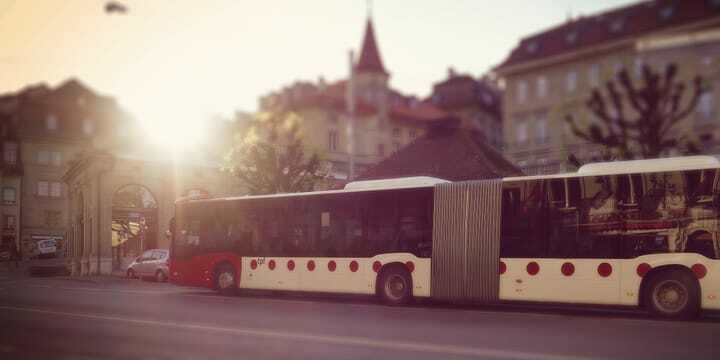 In less than a decade, they will be part of our daily lives. During your next train ride, just look at how millenials rely on voice instead of typing on their keyboard to send an SMS these days. 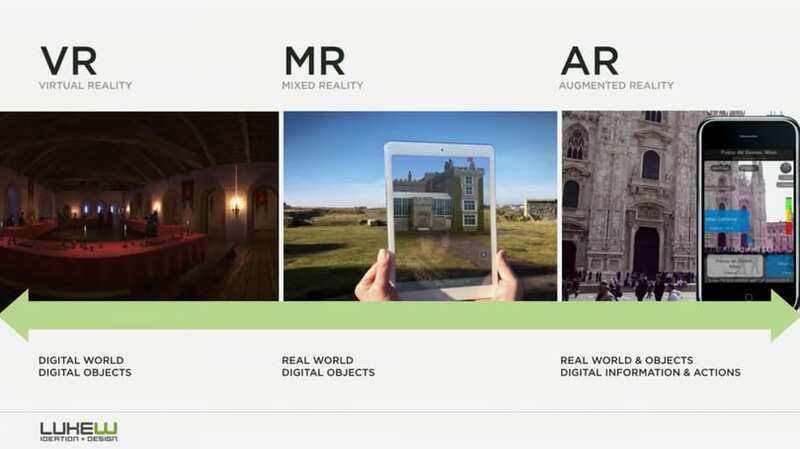 For Luke, AR and VR are in the emergent phase. What this means is that we still have to work out the use cases. It's by experimenting, betting, trying on real consumers, that real use cases will emerge. But he thinks it'll take more time than wrist computers and voice devices.